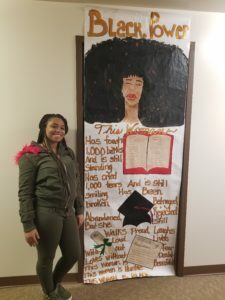 The AAMI’s door art project was inspired by the decorated doors celebrating black history shared across social media in February. 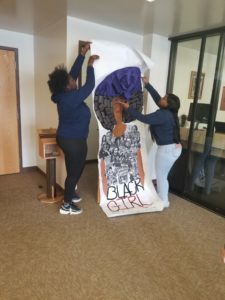 We decided to partner with Cedar Rapids Metro High School to decorate our doors during March both as a way to celebrate Women’s History Month and as a reminder that black history should be celebrated and taught year-round. Check out the video below to hear from the student artists then scroll down to see photos of all of their amazing works! Sophomore Tamika McQueen was also inspired by former First Lady Michelle Obama. 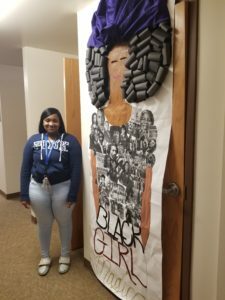 Her door is a colorful celebration of the greatness of black women. Tamika plans to become a crisis counselor and hopes to one day collect enough books to create her own library. 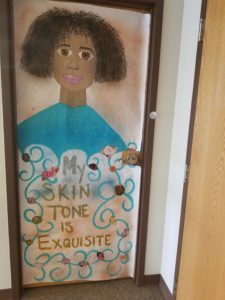 Monteria Howard cites her grandmother as the inspiration for this door art. “I know no one stronger,” she says, and that strength is reflected in this art. Monteria is a junior at Metro High School and plans to become a registered nurse. 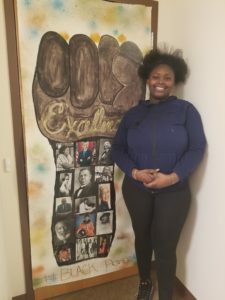 Markita Corbett’s door was inspired by Rosa Park’s legacy of excellence. Markita is currently a freshman at Metro High School. She plans to pursue a career in teaching. 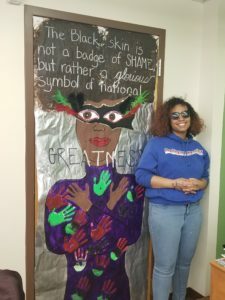 Dynasti Trawick says that her decorated door was inspired by former First Lady Michelle Obama. The work includes the images of many other famous black leaders. Dynasti is currently a sophomore at Metro High School and plans to pursue a career as a nurse. Freshman Hunter Heaton found his inspiration for this artwork in his elementary school principal, Mrs. Day Williams. 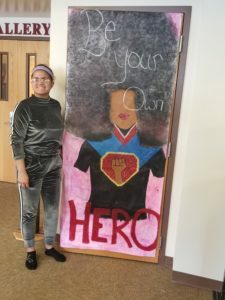 Unfortunately, Hunter was not available to be photographed at the Museum with his decorated door, but we are glad that he was able to take part in the project and show that boys and men can also be proud to celebrate the strong women in their lives. Hunter’s future plans involve an apprenticeship in ironwork.